Good Wear Leather Coat Company — Welcome! Welcome to Good Wear Leather Coat Company. Special note: John Chapman's mother has passed away after an 18 month illness. John and his sister have been primary care givers over that time, and it has been difficult for all involved. There are some emails that have not yet been responded to, and will be soon. We deeply appreciate your support and understanding. We are fascinated by leather jackets from the 1930s to 1950s. Our fascination began with the Type A-2 and Navy jackets, and has spread to civilian styles prominent in the same period. Good Wear Leather opened in 2007 and has been improving and expanding our line of jackets since then. We've spent years studying the nuances of original jackets from that period, and each company had their own special methods of production. Even when labels are missing, one can decipher the maker often by one or two details, from the type of top stitching to pocket design. We believe that a worthy copy of any of these items should have accurate details that are just the same. We make each of our garments by hand, here in Seattle, Washington. With the ability to size each garment to the wearer, our goal is to make a jacket that give years of pleasure. The most important aspect, in our opinion, is using accurate patterns. The companies of the 1940s were trying quite hard to make garments that looked great on the human body, and they frequently did. We copy originals so that the basic elegance is obvious. Though we can customize sizing for each person, the adjustment from the original pattern is often small, not enough that a jacket would look oddly different from an original. Adding a half-inch here or there doesn't make a pattern look wrong, and we have solid evidence from the many originals we've handled that they, too, were inconsistent in the size of each leather panel. For instance, we've handled a good number of size 46 Dubow A-2 jackets from the 27798 contract, and the variance in shoulder width, body length, and sleeve length is quite interesting. Your jacket should fit you right. We've developed new methods to ensure that your jacket will fit you right, and your honest measurements will ensure this. We have longer wait times than most, but each jacket is made by the company owner, John Chapman, and the pace of production, for now, cannot be expanded. We make one jacket at a time. Care is given to the smallest details, and many of our customers are owners of multiple Good Wear Leather jackets. Once a jacket is in hand, it's tempting to get more. We do have plans to expand our methods of making jackets, but that will happen at the pace that secures the quality we make now. We do have a new addition to the company. Vickie Erlandsen has been hired as sales director, and has taken over communication with customers. This has been a massive help, and she is fun to work with. Please get to know her. We purchase our parts from all over the world. There was a time when all these parts were available in the USA, but the days of monstrous manufacturing here are gone. Searches around the world must be done to emulate period clothing. We've gone to Asia and Europe, meeting with many producers of the parts we need, and the tanneries that supply amazing hides that look like hides from the 1940s. Good Wear Leather exists with the help of many great companies, and those companies also care about high quality and customer satisfaction. 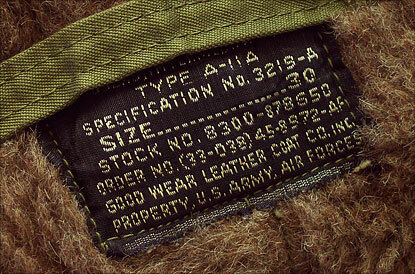 Near the end of World War II, a company named Good Wear Leather Coat Co. produced B-10 and B-17 jacket contracts, and one contract of A-11A flying trousers for the Army Air Forces. We have a set of trousers made by Good Wear Leather and the label from it is seen below. © 2006-2016 Good Wear Leather Coat Company. All rights reserved.